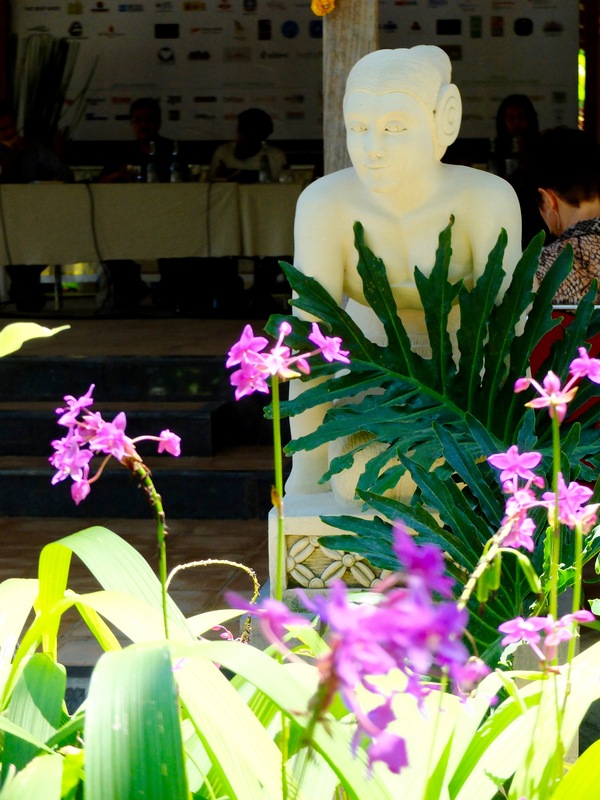 As an unseasonably hot sun set in Ubud last night there were mixed views about how badly the annual Writers & Readers Festival had been affected – or damaged – by the organiser’s decision to cancel scheduled events discussing ‘1965’; the generic term referring to the mass killings that year. Some decried the decision, taken, it was said, due to pressure from the police. Others questioned the motives for the cancellations. In the end, however, two things happened: there was plenty of discussion about the mass killings of 1965, and a great deal of healthy debate about the state of freedom in Indonesia. These were important and useful discussions, which were not just indulged in by a mainly elitist, white-outsider audience. Senior Indonesian journalist Endy Bayuni said in his opening keynote address that for the past seventeen years Indonesia had been free, but recent trends suggested this may no longer be true. Another influential Indonesian journalist, Andreas Harsono, warned of increasing pressure to forbid any public discussion about events of the past. Later, at an informal lunchtime talk given by Dutch author Saskia Wieringa about her novel, Crocodile Hole, victims of 1965 embraced a young woman who broke down and wept. Her grandfather had been a victim. Between sobs she spoke of the stigma of silence that has given her sleepless nights. ‘It is time to stop using fear as a tool to control our emotions,’ she said, as police and intelligence agents hovered on the edge of the venue, unsure what to do. They were further befuddled when approached by a prominent Indonesian lawyer, Todung Mulya Lubis, who asked them if it were illegal for people to read or discuss matters of interest – over lunch, in private. The confused-looking police simply gave up, and beat a retreat after photographing the scene. Other discussions and events over the five day festival also lent urgency to the opening day’s warnings about censorship. Papuan journalist Aprilla Wayar bravely declared that the current Indonesian government is preparing to introduce even stricter controls for reporters in Papua. Galuh Wandita warned of the impunity that is ‘creeping back across the border’ in East Timor, where she says there are no programmes organized to help victims of violence. Meanwhile, for East Timorese filmmaker Francisca Maia, her short film Decisions – about the torture of a young Timorese girl at the hands of Indonesian police during the occupation – brought home again the importance of recounting the tragedies of the past. ‘It’s a big setback, but not the end of the road,’ said Endy Bayuni of the censorship evident not just in Ubud but in other parts of Indonesia at this moment in time. We heard brave words, too, from others who face persecution around the world: from Hyeonseo Lee, who fled the ‘ridiculous state’ of North Korea; from Anchee Minn who fled China under Mao after almost denouncing her own mother; and from Palestinian playwright Nathalie Handal who painfully described how even love is occupied in the occupied territories of Palestine where ‘everyday is a lifetime’. None of us in Ubud this year were really intimidated by the cancellation of certain programmes. And what about those who boycotted or pulled out of the festival as a result of the decision? In my view, they lost their voice, and made it easier for the increasingly conservative Indonesian ruling establishment to play divide and rule. I was left thinking about the words of a young Indonesian poet, Tia Setiadi: ‘Sometimes, to enjoy poetry you need to close your eyes, allowing the sounds of your soul to connect to the sounds outside you.’ We did that this year in Ubud: we closed our eyes to the actions of fearful, small-minded people who would use fear as a weapon. Om Shanti Shanti Shanti Om.